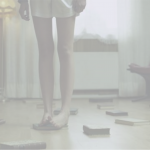 As I write this text in the “office” of Future mind tours, my own feet is placed on a book, – a grammar book supplying the rules of the German and Danish languages and gives the official accepted translation off the words. The rules of a sustainable society in a 100 years are not to be found in any book. It’s needed to be created in the stream of time. 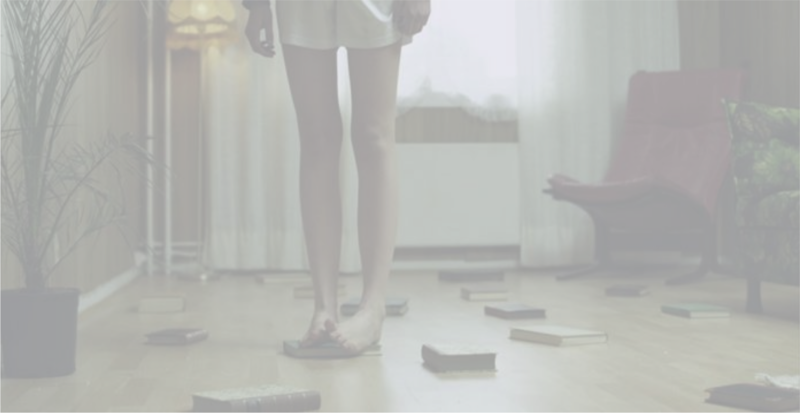 In this room the reisende need to balance on top of books, trapped with previous understanding and thought. They have to do so to move their person and physical body ahead through the room. It can bee seen as an attempt to bring the hard time of reality to the prosperous thoughts, systematic rules or scientific analysis the books represents. The early modernist, Marchel Duchamp, played with the representation of a crystal clear logic, universal rules in a readymade confronted by reality. Like in his gift to his sister on her wedding: It was a geometry book to be hung on a string at the balcony. – The wind and rain had to go through the book, choose its own problems, turn and tear out the pages. He said, for this act, it amused him to bring the idea of happiness and unhappiness into ready-mades. As I see it, the interacting performing and interior playground at the Carlsberg Academi Villa, is conducted by a common theme: To bring the essentially different touch and perspiration of the surrounding real together. A personal and sensuous perceptual interacting with the surroundings, – and the social grasping for a commonly specific reality. It’s the realms that create our mindset. Every reisende is a translator, a creator and an artist who shall use the interior and performers to connect the lingoes of inspiration, body motion and intuitive optimism for the future to a conducted synthesis. The overall theme at the seminar 4, Its our future, love! is people and mindsets. The Future mind tours, Büro reisende, have conducted a “tour de minds” over the 4 seminars. The tour goes by the line of preparation, personal transformation, collection and return. It is now time for the reisende to bring back the new obtained understanding, for the “walk” towards a sustainable future. By groups they should conduct a common agreement on a synthesis of needed value. In one room “Roundtable of fire and commitment” they should derive the one word the assembly could agree on, and write it in the inside of a mask. A transformation mask, – applied a needed mindset, which can be addicted and caught of another individual in the times to come. In a second room “Conscious construction site” The reisende was in an interior of sound and pictures, with should be assembled in collages made by hand. An inspirational value for the cultural mindset, in a transformation towards a sustainable future had to be pinched. The value itself had to be transformed twice: First translated by the reisende, from the sensuous perceptual interacting with the surroundings to a linguistic word, and then translated by the performer to a movement in space. The Future mind tours, Büro reisende have reframed the concept of art; a “social plastic”, developed by the German artist Joseph Beuys. And hopefully as a souvenir of the tour, the Reisende attending the In100y seminars, bring “back” the ability to merge the “whole” real. – An obtained understanding of nature and culture, myth and science as one, or an ability to translate among them.